Sometimes, you might need to search LinkedIn by company. Maybe you’re thinking of applying to a company, and you want to see who you know (or, rather, who is in your extended network) who works for that company so you can approach them to ask some questions or get a referral. Perhaps you’re looking for a decision maker at a company who can help you with a deal, or you’re curious how active a particular company’s employees are on LinkedIn. You can also look for key thought leaders whom you might want to approach for an informational interview. While logged in to LinkedIn, click the Advanced link at the top of the page. You’re taken to the Advanced People Search page. Enter the name of the company in the Company text box. If you want to search for only current employees of the company, change the drop-down list choice from the Current or Past option to just Current. If you don’t change the default option, your search results will include all the people who ever worked for that company and included that job on their LinkedIn profiles. For better results, modify your search. 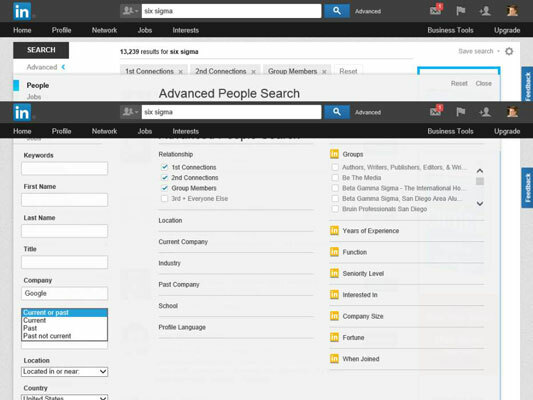 You can enter more information, such as job titles, user types, or location information, into the boxes provided on the left side of the Search Results screen. Then click the Search button. Also, you can scroll down and pick specific filters to refine your search results.